Much more difficult than I imagined. And it’s not like I’m writing a completely made up fiction story here, I’m writing about something I actually did. 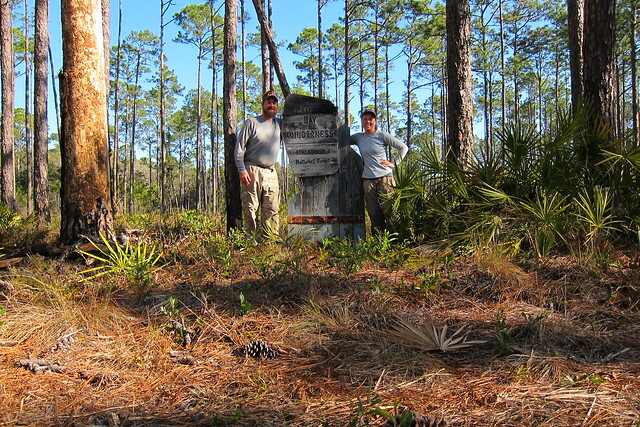 Two years ago, late summer 2011 at about the same time of year it is now—the sun adjusting its position in the sky, the flora preparing for a time of rest—I decided I’d write about our thru-hike of the Florida Trail. Back when we started on the Appalachian Trail in March of 2010 I’d decided before the hike that I was not going to go into the hike with the intent on writing a book. There were already a lot of books on the market then and I didn’t really feel I had something special to share (though my opinion on that has now changed) and so I didn’t keep a very detailed log along the way of what we did. Sure, I wrote here and there in a little journal, but mostly I’d blog when I got to a town and then of course I wrote up a more detailed overview of the hike after we were home that Fall of 2010. And then we went on the Florida Trail and in the back of my mind I had the inklings that I wanted to write a book about it. I fought the idea for awhile after, still not thinking it was useful or worthwhile to do. Again, I didn’t exactly have some kind of monumental story. But, you know, not everyone has a monumental story when they go hiking through the woods. A story doesn’t necessarily have to be monumental, does it? I began writing about our hike on the Florida Trail and I thought, “Hey, this will be pretty easy, I’ll have it wrapped up by the end of the year! !” Hahahahahahaha! Funny, right? Mix my undisciplined self with my multi-tasking creative mind and throw in everyday life and you have me still writing this book two years later. I’ve been writing in fits and spurts. It was a bit more disciplined in the beginning and then it was weeks or months before I wrote again. This summer I’ve wrote somewhat consistently, if you can call it that, but a little bit of something every few weeks. I definitely feel as if I do better writing in huge chunks at a time, pounding out words on the keyboard for a few hours, than I do devoting an hour a night to writing a thousand words. Writing about walking in the woods is tedious sometimes. Not every day is exciting and sometimes it is impossible to translate feelings of a moment into words on a Word document. (Yes, for you writerly types who are advanced in other writing software, I haven’t progressed that far yet. I’m also too far in to switch, I think.) How can I tell you the gloriousness of the sunshine dappling through the pine trees in the Ocala National Forest paired with the aroma of the pine sap and needles heating up from the forest floor? What about the thoughts I was thinking as I was looking down at my feet, watching the trail for tripping hazards as I felt the sun on my face and those smells? How can I even begin to get that out? I don’t half of the time, or even most of the time. There’s also something that bothers me, the thought that this is going to be the most boring thing ever. EVER. And of course that goes against what I’m trying to accomplish here, to put more literature out about the Florida Trail to entice more people to hike this trail. There’s only three (maybe four) other memoirs about the Florida Trail out there, compared to the dozens and dozens on the AT. Even the PCT has more than the Florida Trail, I’m sure the CDT does too. Currently I’m writing this as a very first person, almost journal type way. There’s no dialogue. That’s something that’s baffled me and I’ve brought it up to two other writers I know, how do people writing memoirs write dialogue? I mean, it can’t possibly be 100% accurate. On the Florida Trail I did a nightly recording into a small voice recorder that I will use to fill in gaps in my memory after I’ve written the book, but that’s it. I didn’t quote any discussions that we had with anyone we hiked with or encountered. And on one hand I just don’t care if I don’t have dialogue, its my book whether it gets published or not. I guess I’m writing this to say, yes, I’m still writing this danged book if you even knew I was writing it. It’s hard. I’m not disciplined. Walking in the woods can be uneventful sometimes, even if you are enjoying the moment; it is difficult to put those feelings into words, the uneventfulness of what backpacking can be. You get up, you eat breakfast, put the tent up, pack your pack, walk a few hours, take a snack break, walk a few more hours, eat lunch, do the same morning routine for the afternoon, then eat dinner, relax for a bit, and then hit the sack. And some days that is broken up with things that are exciting or dramatic, but most days it is just that, filled with all of these moments and feelings in your head. Of course, it is life, just life in a different format. And life isn’t always filled with events, is it? Currently I’m at about 71,000 words and am finally heading west on the trail instead of north. I’m about to write about the nasty, nasty rain day where we were soaked through our clothes in a combination of sweat and rain by lunch, right before we got to White Springs. Now, that was an eventful day. Keep on writing, Misti! It’ll be absolutely worth it when you finish. And I definitely want to read it! ..another reader here. I LOOK for trail memoirs and there are so few. Keep going.. It will be great!! Dang. I should have read through your blog before writing you an e-mail. I missed a lot about what’s going on in your life!!! You are so courageous. I envy your goal and attempt. I don’t know first-hand, but have heard about the crazy roller coaster writing a book takes you on. But everyone says it is worth it. So keep up the good work! 71,000 words is nothing to sneeze at!! Oh, Misti, you just did! That was breathtaking. I hope you’ll let me have a peek at it when you are done. I’d love to read more!